Can I just be honest with y'all? I did my first two random acts of kindness (RAoK) today (for my birthday challenge remember?) and doing those two little things for others today made ME so stinking happy. I could easily get addicted to this. Today I sent three small loaves of banana bread to school with Annelise, for her two teachers and the sweet lady that works the morning car line. That was easy! I hope they liked it and it brightened their day. This afternoon I decided to do my first random, random thing, like for a stranger. I gathered my courage and got into the drive-thru line at Starbucks. At first I thought I wouldn't be able to treat someone to a latte (or whatever) because no one pulled in the line behind me for a while. (!!) Just as I was about to pull up to the window I noticed another car behind me. Yay! And for some freakish reason my heart started beating faster. (!!) What in the world? There must be some sort of RAoK adrenaline rush that I had no idea existed. When I handed the Starbucks lady my debit card I asked her if I could pay for the lady's drink behind me (as if I needed permission? I don't know. What should I say? ), and she said sure. And that was that. Except I was sooooo happy as I drove off to know I surprised that lady and maybe made her afternoon a little bit better and maybe, just maybe she'll do something nice for someone else. As I'm working on my little challenge this month I'm so encouraged to know that many of you are joining me in your neck of the woods. Thank you! That makes me crazy happy! Some things will be random, some will be more intentional, some will be for strangers or community service people that I don't really know, some will be for friends, some will cost a little $$, some a little bit more $$$ and some will be basically free. I'm crazy excited about this! And...along this same random (or intentional) act of kindness vein, have you heard about The Happy Day Project? Julie and Jeannett have teamed up to spread a whole bunch of awesome. Was our supper tonight. Served over brown rice and with oven roasted broccoli. My people raved about it. Okay, not really. They liked it and ate it. Even though I made the tragic mistake of serving Annelise's over her rice, instead of separately. Oh the horror of food and sauce mingling. I've been listening to my She & Him station on Pandora this evening. I may need to download the She & Him Christmas album. Not yet, but soon. I've made a firm commitment to exercise every day until my birthday (11.22) following a random plan of running (or wogging), TurboFire, P90X, etc. I did shoulders & arms of P90X (my arms finally recovered from chest and back last week, ay, yi, YI) and a TurboFire disc on Tuesday (11.1). It felt great! Then I did nothing on Wednesday due to a smashing headache that lasted most of the day. So I'm obviously off to a roaring start. But I did TurboFire again today, so I'm back on track. It felt great! And I only ate two pieces of candy from Annelise's stash today. This is progress y'all. Ok, I just laughed (with glee!) all the way through this post...because I just did the same thing! 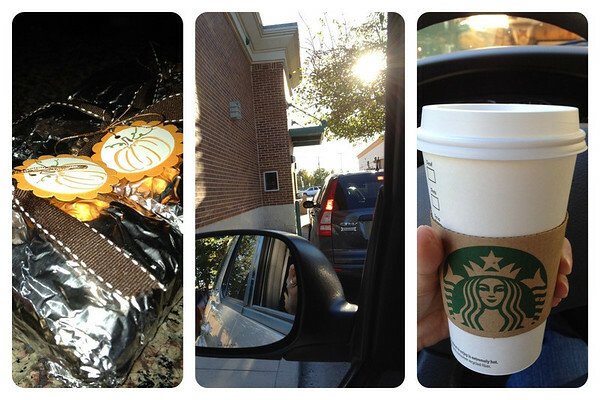 (Starbucks, not banana bread) And just like you, as I drove up to the window my heart started pounding! Like I was about to do something wrong. :) When I got to the window I leaned forward and almost whispered to the lady, "I'd like to pay for the car behind me too, please" like the person behind me in line might hear me. :) And then I giggled all the way home! Several months (a year??) ago, I heard a story on K-love about someone who did this at Starbucks, and then people kept paying for the car behind them ALL DAY LONG!! Isn't that the coolest? You never know what one act of kindness will do! I love this! You're right, it IS so fun to unexpectedly bless people. Thank you for sharing your birthday challenge and for letting me play along. :) More RAoKs to come! And I can't wait to do my own challenge on my birthday next month. Would you mind if I linked to your RAoK post on my blog and Facebook page? Why doesn't your Starbucks have the fun red seasonal cups that rolled out Nov 1?! But seriously, love your ideas! You're off to a great start! I saw the Happy Day Project and immediately thought of you. I'm off to a slow start, but I'm always looking for kindness opportunities. Two of our family friends (girlfriends of adult cousins) have pinned She & Him Christmas album, so I'm fairly certain I'll be checking it out. Can you please send the exercise motivation this way? I am still in my funk (now several months). I get to the gym or do something at home about twice a week, but I know I need to do more. Ugh. Natasha: I didn't realize the red ones were out. I feel cheated. Nicole: Let's hold each other accountable okay? i need it! I downloaded a couple of She/Him Christmas songs the other day. Love. I do think it is weird how when we do good things for strangers, sometimes it's totally scary. I've had the same exact type of experience, so you are not alone. Maybe as we practice more, the butterflies will go away.